← Wordless Wednesday – The Real Reason Why the Chicken Crossed the Road? 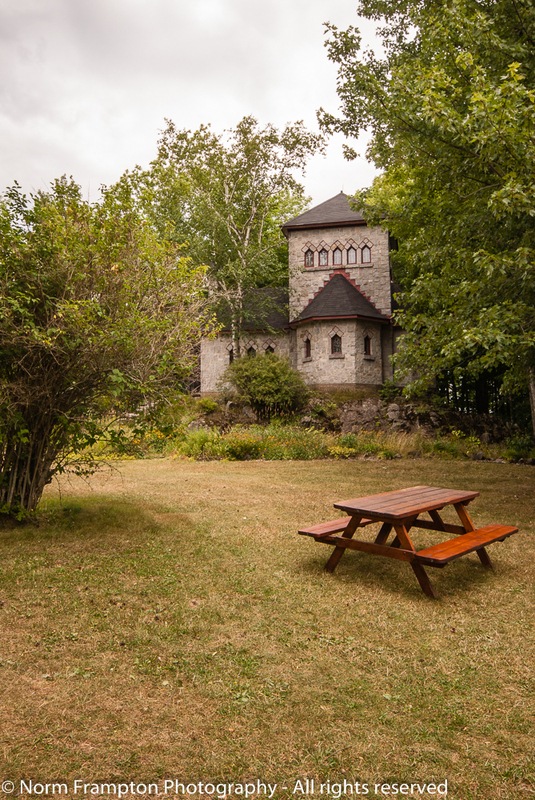 Earlier this summer while on a mini-vacation road trip in Québec’s Eastern Townships we visited the Benedictine Abbey at Saint-Benoit-du-Lac. The monastery was established in 1912 by a group of exiled monks from the Fontanelle Abbey of St. Wandrille France. The current structure was built in 1934/35 and is situated on a multi-acre site overlooking the western shores of Lake Memphremagog, not far from the U.S. border, about a ninety minute drive southeast of Montréal. 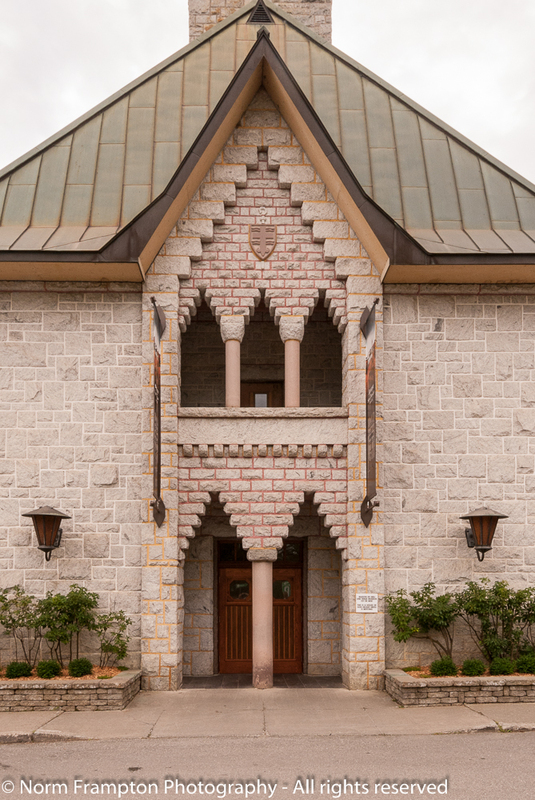 The abbey is home to roughly thirty monks in full-time residence who live a monastic life that is devoted to prayer, hard work, and service to the community, all while maintaining a vow of silence. In fact for those who are looking to get away from it all for a few days of peace and quiet, or if you’re interested in experiencing monastic living, the abbey does accept a limited number of overnight guests. Dorm rooms can be reserved for short stays for a suggested donation of only $60.00 per night which includes three meals per day. To finance the abbey’s operations there is a gift shop on-site that sells artisanal cheeses, jams, honey, and other products made by the monks from produce grown on the complex and in their nearby orchards. 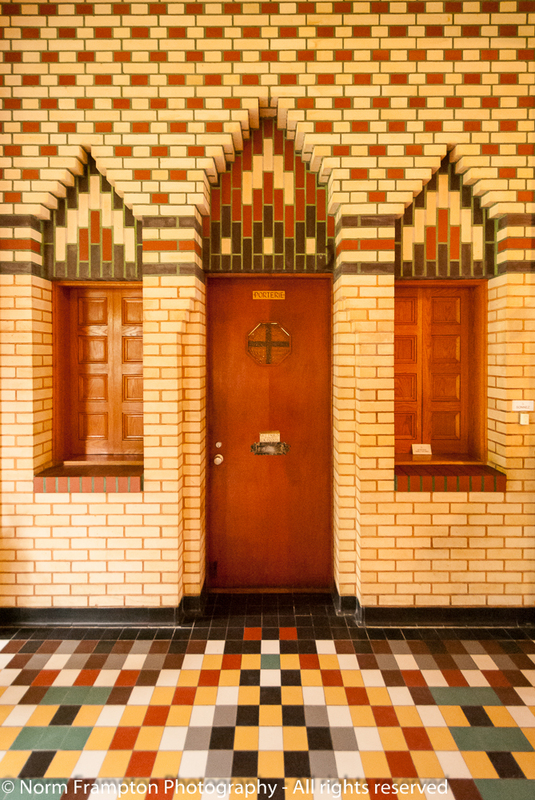 As we stroll around admiring the doors you’ll notice one of the main features of the abbey is the multi-colored patterned tile and brickwork, that is repeated throughout the building. Whether you’re religious or not, walking through a place like this slows you down, quiets and clears the mind, and offers you the opportunity for somber reflection. 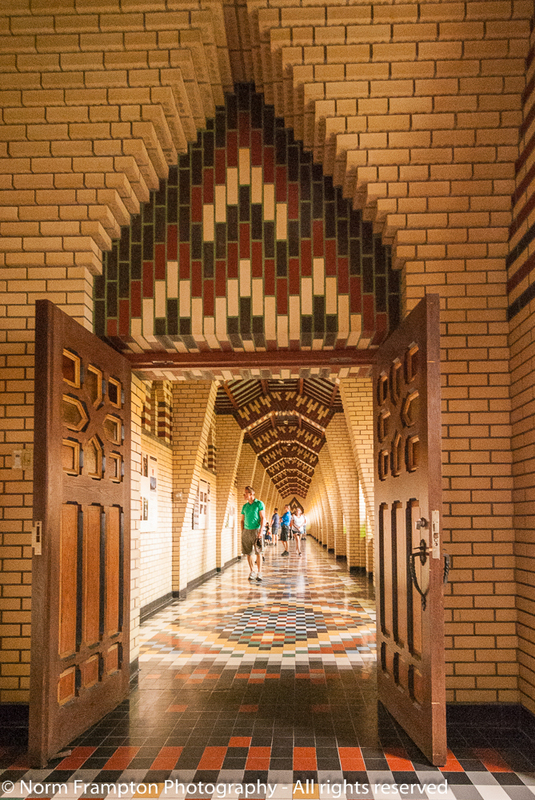 This hallway leads to the main chapel where the monks perform their prayers multiple times per day, in the form of Gregorian Chant. 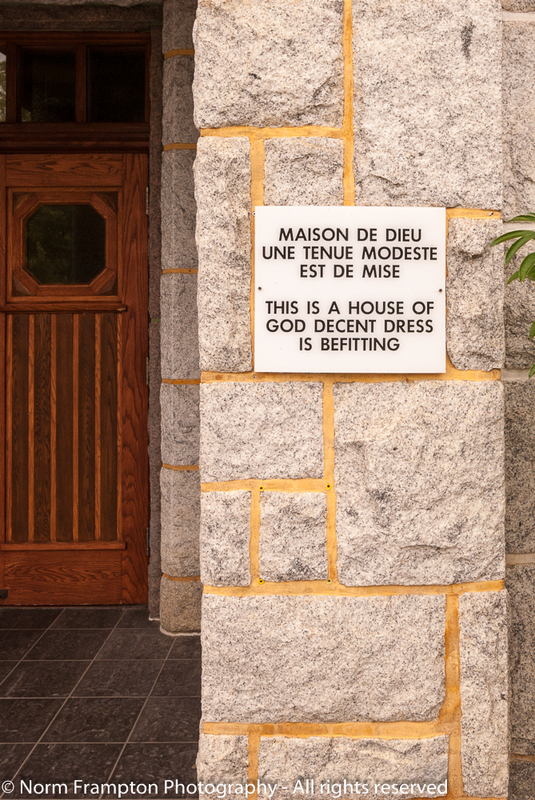 The hallway is lined with display signs that describe the history of the benedictine ‘movement’ and how these monks ended up in rural Québec. Photography in the chapel is not permitted when the monks are in prayer. So though I have no photos of the chapel for you, the good news is that it meant we were there while the monks were chanting. After touring the main building we decided to walk around the grounds for a bit and I’m glad we did. Up a small hill on the other side of the parking lot we discovered this tiny secondary chapel hidden among the trees. It was so dark that none of my interior shots came out, but hey, it sure has a pretty door don’t you think? Located at 1 rue Principale in Saint-Benoit-du-Lac, Québec, the Abbey and its gift shop are open seven days a week, 9:00 am to 6:00 pm from May through October, and 9:00 am to 5:00 pm from November through April. 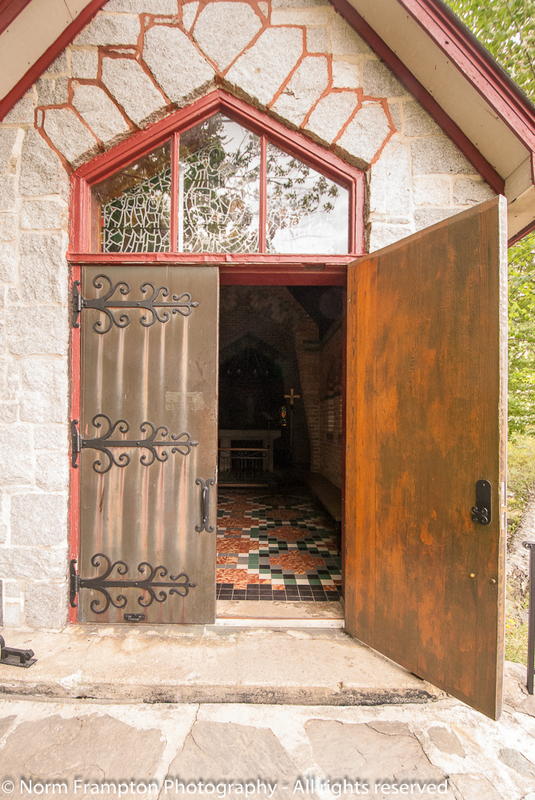 Gallery | This entry was posted in Photography, Thursday Doors and tagged Abbey, Doors, Eastern Townships, Gregorian Chants, Magog, Monks, Québec, Saint-Benoit-du-Lac, Thursday Doors, Tourism. Bookmark the permalink. What a beautiful, tranquil place, Norm. I love those coloured tiles, so unusual to see them in an abbey. The idea of an overnight stay really appeals, especially at such a great price. Norm, I didn’t get a Thursday’s Doors post out this week. Your collection is elegant, grand and beautiful. Abbey’s seem to me to be the best places to capture intriguing elements, on every turn. Oh, I just want to retire and do my blog: ha ha! 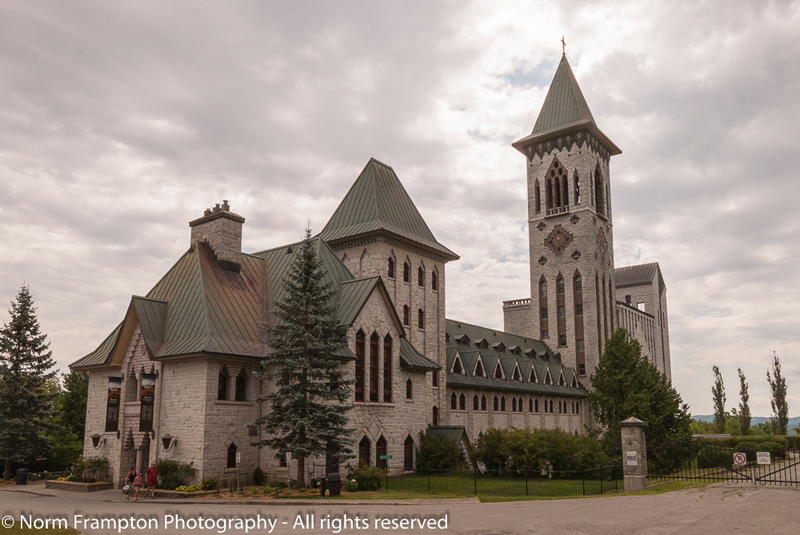 Anyway, the Benedictine Abbey in Quebec is a really unique site and resembles European and also, Turkish influences. 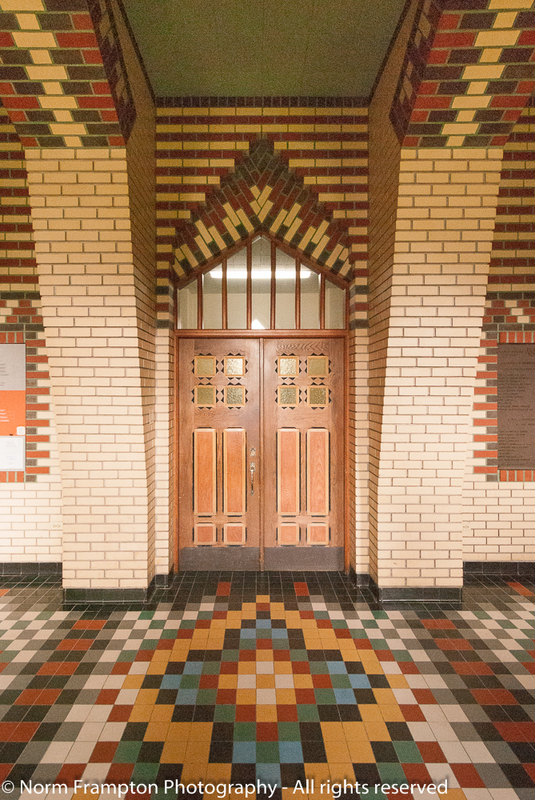 Those tan, brown and red brick tiles and their patterns have Eastern influences. What a great place and great photos! I loved all of them! I would find it difficult though to be restful and peaceful with all the colored tiles! Thanks. You’re right, the patterns and colours are visually jarring. Absolutely exquisite. Reminds me of a church in Nova Scotia. Thank you for sharing these vivid and creative photos. A lot of fancy brick and stone work – those monks are very talented. Wow! Beautiful and awesome, Norm. You’re managing to find and photographing some fantastic doorscursions! The hidden chapel was great too! I’m curious, if you take a guided of the monastery do the guides speak or do they just point to signs. Thanks I had the same reaction to the tiles, I really wasn’t expecting that. Beautiful collection of doors! And a remarkable place. Definitely worth a visit. I love the vividness of your photos today. Stunning, peaceful, beautiful – what else can I say, this is a wonderful place and gorgeously photographed! This is and especially wonderful post today. The pictures are beautiful, and the narrative makes them even more interesting. This is a place I would love to visit. Thanks Charles. Places that are designed to promote calm quiet introspection are good for the spirit and for our sanity! That confessional looks pretty serious! My favorite shot was the one taken from below the stone steps that lead up to the chapel. It is beautiful to see the steps of time worn into those stones. Great photos this week Norm. Thanks for the kind words about the pics, I’m glad you liked them. Ah. I wondered about that. I tried refreshing several times but didn’t see my link. You never cease to amaze and delight me with your doors. I only have one door for you today. Beautiful building inside and outside. 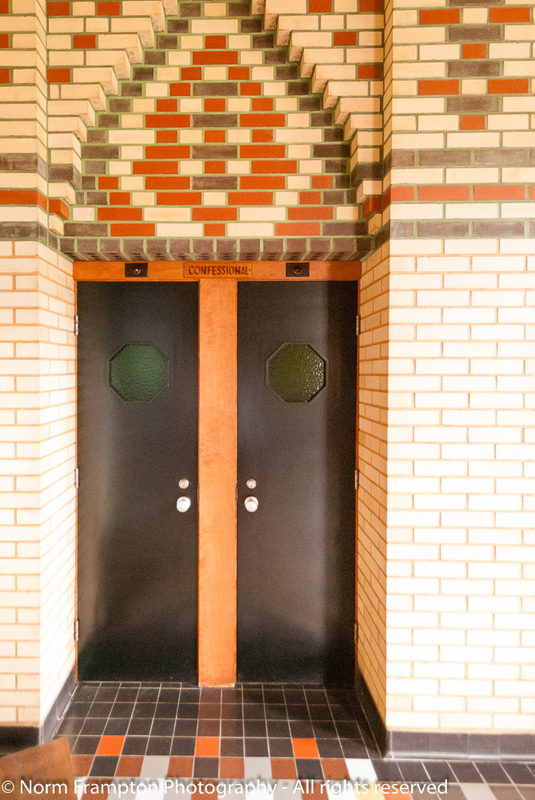 Love the doors, floors, and walls. I know I’m weird, but I do love listening to monks chant. You’re not weird at all. It is very soothing to listen to. For a while, about 20 years ago there was bit of a resurgence in the popularity of Gregorian chants. There was one really popular CD put out by a group of monks in Spain that actually made it onto the charts in a few countries. 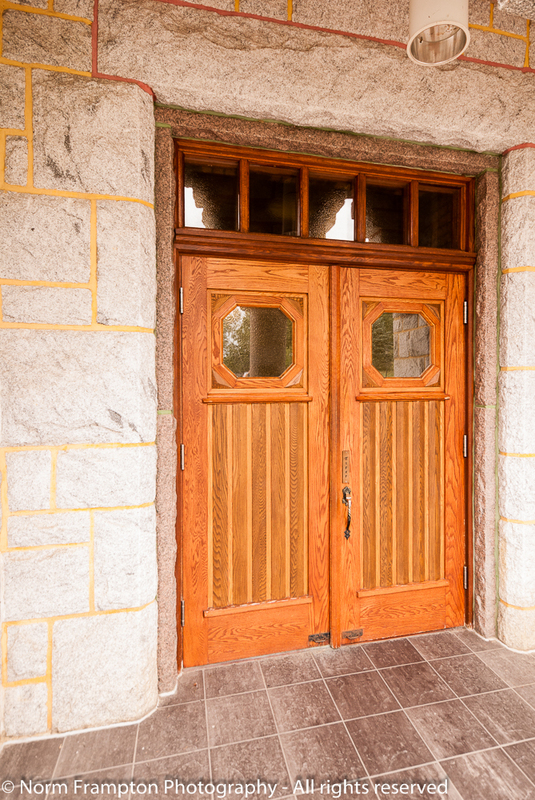 Thanks so much for sharing these doors and other photos, Norm. That shot down the hallway through the open doors is my favorite. I can feel the stress draining, just looking at the photo. These are beautiful doors and the building itself is amazing. 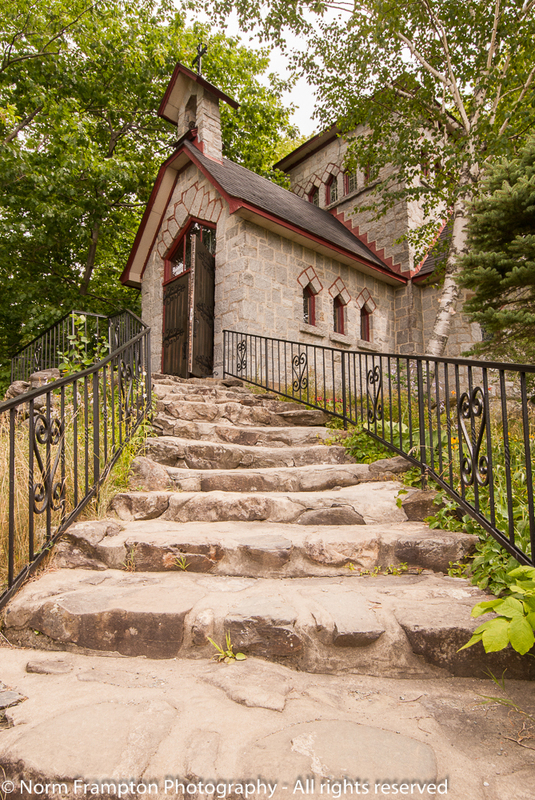 I;m so glad you stumbled onto the mini-chapel – what a lovely building to find hiding in the woods. Thanks Dan. It was such a peaceful way to spend an afternoon. I can see why some people go back and spend a few days a year there. Absolutely stunning! Nothing dull about those corridors and rooms! There’s creativity and joy in every square inch. But I’m curious about decent dress: Since God created us naked, does that mean you had to take off all your clothes to go into the church? –Seriously, what a wonderful tour you shared with us! Tiny-house nut that I am, I LOVE the tiny chapel. It was an interesting place to visit, and the chanting was…heavenly of course! Gorgeous, stunning, amazing, beautiful place! Oh little secondary chapel has stolen my heart. 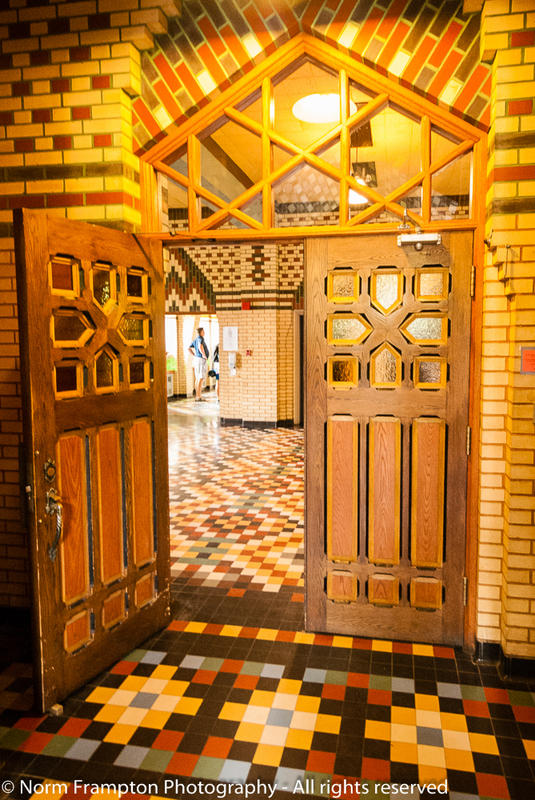 How fabulous are those doors? Great stuff, Norm! Thanks Joey. That little chapel was so pretty inside too. It’s too bad none of those shots turned out. What a glorious place, one filled with workmanship showing that the creators used their skills from the Creator in marvelous ways, even though, as Judy says, it might be a bit over the top.. I love both the structures, large and small. What wonderful stone! Thanks for sharing this, Norm. Thanks Judy. It’s a little off the beaten path and not mentioned in most of the tourism guide books which is exactly the kind of place I like to discover and share with others. For such a quiet place, the visual stimulation is shouting out loud!! It’s interesting that while they have forsaken speech, they seem to have compensated with all this “eye candy”. I’m assuming that while it was very quiet and peaceful inside, it was also energizing. My favourite photo is the one of the stairs leading up to the small chapel. I feel like I could walk into that picture. Thanks Joanne. It took me a few tries to get that stair shop exactly the way I wanted it, but I’m glad I went through the extra effort. Oooh, I could feel how befitting grand time you were having there! Amazing shots!